Powerhouse Racing is happy to introduce a complete solution for wastegate plumbing for PHR S23 and S45 Turbo manifolds and Kits. 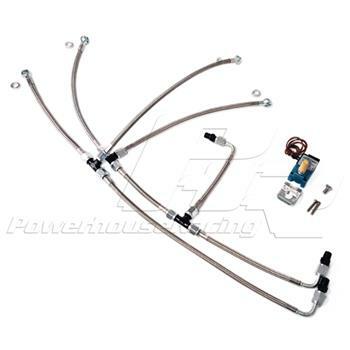 This kit provides all stainless plumbing for boost control using a 3-port boost solenoid, the boost solenoid itself, as well as PHR’s billet solenoid bracket. Save time and get rid of rubber vacuum tubing by upgrading to full stainless -4 lines. Make yours an engine bay to envy.